One detail often lost in the heated debate over the creation of a public health insurance option is that the government is already providing health care to many children who would otherwise go without. Had it not been for public insurance, the share of children without any coverage would have grown from 2000 to 2008. Over that eight-year period, children under the age of 18 lost employer-sponsored health insurance at a faster rate than adults aged 18 to 64, but children also picked up public health insurance coverage at a faster rate. 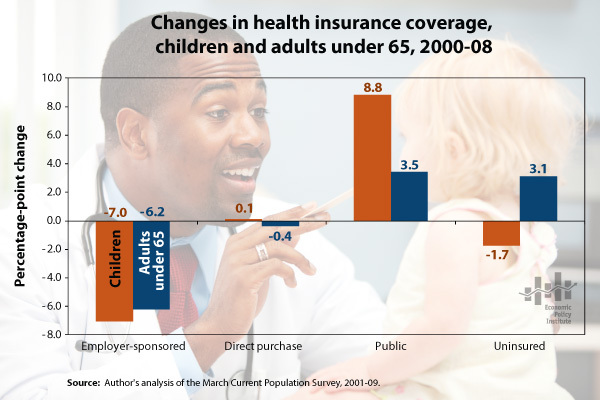 As shown below (See figure), the share of children without insurance dropped 1.7 percentage points between 2000 and 2008, while the share of adults under the age of 65 without insurance rose 3.1 percentage points. By contrast, the share of children with public coverage grew 8.8 percentage points, as compared to only a 3.5 percentage point increase for the adult population under 65. Public insurance in the form of Medicaid and the State Children’s Health Insurance Program (SCHIP) provided a safety net source of insurance coverage for 23 million children in 2008. The differences in the overall coverage rates between children and adults reflects a somewhat more comprehensive system of public health insurance for children than for non-Medicare eligible adults. While Medicaid provides coverage primarily to poor children and adults, SCHIP was designed to cover uninsured children in families with incomes that are modest but too high to qualify for Medicaid. That said, there were still 7.3 million uninsured children and 38.3 million uninsured adults under age 65 in 2008.